This entry was posted in economy of words, George Jones, Joe Moore, writing, writing advice, writing books, writing craft, writing exercise, writing tip, writing tips by Joe Moore. Bookmark the permalink. 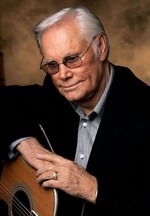 Country music is not my first choice but I loved George Jones. Three of my closest friends and I made a pact that when the Possum died we would stop whatever we were doing, meet up, and raise a glass. And that we did. Besides the gut-wrenching sad songs, he sang some of the most light-hearted as well. “White Lightening”, “The Flintstone Song”, and “The Corvette Song” are three of my favourites. Good advice, Mr. Moore. Songs are two minutes stories with a hook and a rhythm. Interesting. Thanks, Amanda. And anyone interested in flash fiction should study country music lyrics. Excellent post, Joe. I love the storytelling of country music. It can be funny, visual, and poignant. I also love how you connected writing to creating imagery through music lyrics. Very true. Lyrics can be great story inspirations, for sure. And when someone gets it right like this song, you never forget it. A well-written country song is a writing lesson anyone can learn from. The best could be used as treatments for excellent novels in th right hands. There are half a dozen Delbert McClinton songs I’d love to base stories on. Great post, Joe. Jones in around three minutes created a classic. The odd thing was that he didn’t even want to record the song initially. I’m glad that cooler heads prevailed. That story about the tractor is but one of many colorful stories surrounding the man. He walked a tightrope for decades. Thanks. You’re right, Joe. He pretty much hated the song when he first heard it and refused to learn it. He said no one would like such a sad, depressing song. Good thing he was into singing and not marketing. Never a big fan of Jones, because I have never been a fan of country music, but I teach poetry from the starting point of music, and I use artists ranging from Metallica to Public Enemy to Rise Against to Flyleaf to Brad Paisley to Tupac Shakur to Nina Simone. I do so for the same reason, because each and every word matters, and it’s important to be able to pierce that veil and understand the emotion, context, and usage of each one of those words to get the full force of the poem. Same is true of story. Great post, Joe. Great work on your part, Jake. I wonder how may kids who love rap music realize they’re learning the most modern form of poetry? Whatever it takes! “Economy of words!” Absolutely, Joe. When the music is playing through a story, the reader just floats away. Now THAT’S entertainment. Music is always an inspiration for me. Couldn’t agree more, Jim. Thanks for “chiming” in. Great post Joe. I’ve found the same compact thoughts in other music as well. My favorite is Gladys Knight’s great hit Midnight Train to Georgia. The first line always gets to me. Here it is. LA proved to much for the man. Good example, Brian. We can find great stories and storytellers in most music genre. Country seems to always be consistent in the story-telling game. I always appreciate the economy of words advice. But I also appreciate the words of Pat Conroy: The cool, hard sentences of Hemingway were spare and shapely, but his sentences were trays of ice to me. I never could enroll in that it-is-true-and-good-and-spare-and-find school of American writing. Of course, he loved his adjectives too. Julie, you’re right. Sometimes you can strip off so much meat that the bone is too bare. Compression specialist George Jones, welcome to the next world. Please meet expansion specialist Thomas Wolfe (there’s matchup for you). I love good descriptive, evocative imagery that comes from clean writing both in music and in text. Get to the point quickly but still draw the fullest picture from the reader’s / listener’s mind, that’s the goal. We’re on the same page, Basil. Perhaps we should all be required to write a song version of our novels before tackling a full-length manuscript. I’m a freelance editor and just finished two separate nonfiction manuscripts written by authors whose word economies are suffering from severe inflation. My eyes are crossed, my shoulders ache and I did babble in the corner for a short while yesterday. I love reading authors who have the gift of powerful brevity. Many of my favorite authors do, and I recently finished reading “Ordinary Grace” by William Kent Krueger. Excellent word economy there, and I highly recommend the book. Thanks for the post, Joe! Thanks, Diane. I’ll put ORDINARY GRACE on my TBR list. This was a great dialog. I enjoyed reading the post and I am pleasantly surprised to see that I am not the only one who gets inspiration from music. Sometimes it is to get into a time period, or character’s attitude but just as often I get a seed of an idea from a song. The old country song “Elusive Dreams” recently inspired a short story, though I changed the story teller to a teen who’s father dragged the family all over, the original idea came from remembering that song. Thank you for this post. I grew up on country and remember ‘The Possum’ well. Thanks Sherri and Melissa for dropping by TKZ and sharing your thoughts. And I’ve met Kent Krueger and he will be so appreciative of the read . . . I could not agree more with this post. When I wrote a set of articles about flash fiction, I used Bob Seger’s “Night Moves” as a way to describe characters and infer their motives without ever using ordinary adjectives. No doubts there at all about their appearance or what is on their mind. You were fortunate to have seen him in person, Mark. He will be missed.